Finished Size: Small/Medium. To fit bust sizes 33”-36” (85-90cm) and upper arm circumference 12” (30cm). 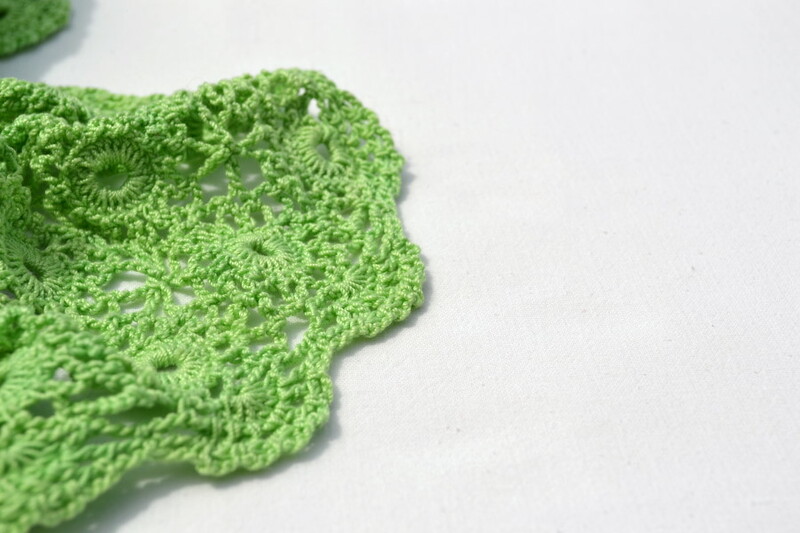 ch — chain, ch sp — chain space, dc — double crochet, sc — single crochet, sl st — slip stitch, st(s) — stitch(es), tc — treble crochet, () — work directions in brackets as many times as specified. Round 1: Make a magic ring. Ch 3 (counted as first dc), 23 dc in ring. Join with sl st to top chain of ch-3. Round 2: (Ch 5, skip next st, 1 sc in next st) — 11 times, ch 2, skip next st, 1 dc. Round 3: (Ch 5, 1 sc in ch sp, ch 5, 1 sc in ch sp, ch 7, 1 sc in ch sp) — 4 times. Row 1: Make a magic ring. 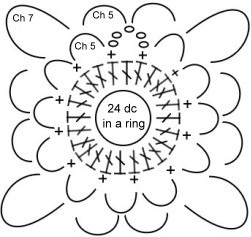 Ch 3 (counted as first dc), 14 dc in ring. Turn motif. Row 2: Ch 5, 1 sc in next st, (ch 5, skip next st, 1 sc in next st) — 5 times, ch 2, 1 dc in last st. Turn motif. Row 3: (Ch 7, 1 sc in ch sp, ch 5, 1 sc in ch sp, ch 5, 1 sc in ch sp) — 2 times, ch 7, 1 sc in last ch sp. Fasten off for the first motif only. 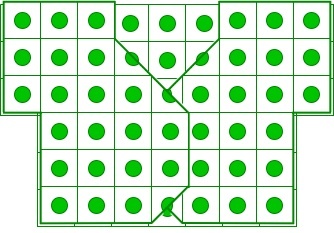 Proceed to 'Join as Motif Layout: you go' for the rest of the motifs. Crochet one ready motif (A), start the second one (B), on the round 3 repeat (ch 5, sc in a chain space, ch 5, sc in a ch sp, ch 7, sc in a ch sp) - 2 times, ch 5, sc in a ch sp, ch 5, sc in a ch sp, ch 3, sl st in a ch sp (on angle) of first motif A, ch 3 and go back with sc in a ch sp (motif B), repeat it one more time. You get two angle joined motifs. If you need to join 3 or 4 angles, repeat (ch sp, ch 5, sc in a ch sp, ch 3, sl st in a ch sp (on angle) of first motif A, ch 3 and go back with sc in a ch sp (motif B) — 3 or 4 times, and ( ch 5, sc in a chain space, ch 5, sc in a ch sp, ch 7, sc in a ch sp) — 1 or 0 times. Do not forget to join shoulders, underarms and sides (arrows on the bottom picture). If you lost some joinings, you can join them later, with a needle. Join thread at space between any two 5 chain spaces. space) — work round and repeat until you return to the start. Make finally ch 2 and join with sl. st.
ch 3, sc in a ch space) — repeat and work round, make ch 3 and join with sl. st.
row, ch 3 — repeat to the end. Join with sl. st.
this is a beautiful bolero, thank you for the pattern! Yes, of course! You should fasten off for the first motif only, and join the rest of motifs using 'join-as-you-go' method. Complete one motif. Complete another motif, working through all rounds except the last one. Join the corners and two ch spaces of the two motifs, while working the last round of the second motif. Each corner has a ch-7 sp so ch 3, make the join (1 sc into ch-7 sp of the first motif), ch 3 again. Then join in same manner 2 ch spaces of one side: ch 2, 1 sc into ch-5 sp of the first motif, ch 2. And repeat the joining for the second corner. Work in the same manner if you need to join more than two sides. I love this pattern and was looking for some help with the Magic Ring. I tried the link for the Magic Circle on the Bullion Hearts pattern, but it didn't seem to work.